It’s not really about the one who got away — unless the one who got away is the person you used to be before early middle age and the often self-imposed exhaustion of modern life swallowed you up. It’s not full of things that have been said before; it’s full of things that are not said enough and wholly deserves to be set apart from other books of its ilk….In particular, Hilton captures and distils the slight but constant ripping at the seams that can happen in a marriage when there is simply no time to nurture it. She writes about matrimony with rare honesty. As moving as it is entertaining, this Canadian novel is crammed with funny, truthful moments that will strike a chord with over-extended women everywhere. Hilton reaches right into the hearts, minds and insecurities of women and let’s them know they are not alone in their struggles. . . . So beautifully depicted you will want to read it again to pick up the wisdom you missed the first time through. Modern women are often expected to “have it all,” and women with kids are hit with the brunt of those expectations. The Hole in the Middle is a novel all about the reality underneath the “superwoman” image. Your mom friend will find it totally reassuring that she’s not the only one who can’t manage everything all the time. This novel is for any woman who’s ever had to juggle marriage, children, a toxic work environment, and multiple guilt-ridden friendships because there isn’t time to do it all, let alone well. Throw in a lovelorn co-worker and an unrequited love affair from the past and Sophie Whelan’s roller coaster life goes into overdrive. Author Kate Hilton spares nothing when it comes to writing scenes of life in the corporate world. Is it possible to flinch and double up laughing at the same time? I did. Read this book for the wonderful characters and a satisfying plot, but most of all, read it for the wit and wisdom of this talented storyteller. Kate Hilton delivers a clever and compelling novel about second-guesses and second-chances. With equal measures of hilarity and heartbreak, Hilton weaves an honest and engaging story of middle life struggles. Hilton gives a touching, true-to-life account of today’s busy woman and the choices she makes–and later questions. A Hole in the Middle is filled with witty, authentic characters we root for and fall in love with–flaws and all. 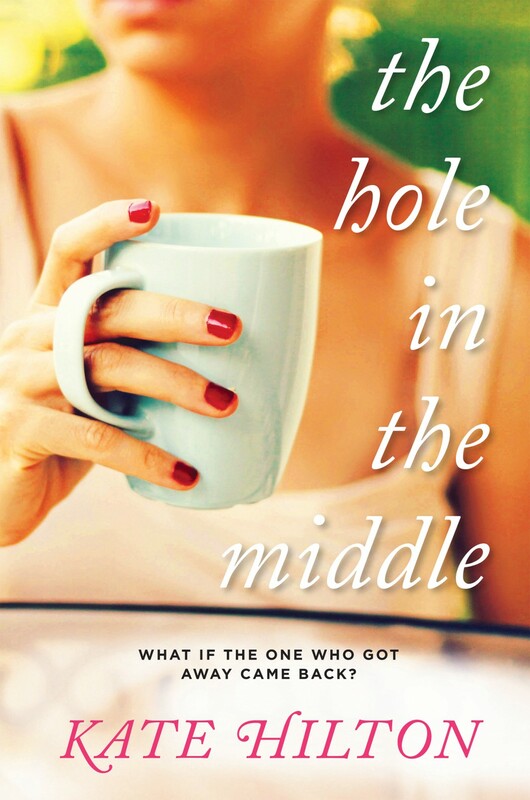 With issues and struggles every woman can relate to, A Hole in the Middle is the perfect read for any woman who has ever questioned the choices she made, or wondered what might have been. An impeccably written, highly-entertaining novel that kept me turning pages into the wee hours of the morning. Kate Hilton’s debut marks the entrance of an exciting, fresh and funny new voice in women’s fiction. Smart, spirited and fiercely honest, THE HOLE IN THE MIDDLE illustrates, with pinpoint accuracy, the pitfalls of juggling work and family. Sophie Whelan is a modern Everywoman, admirable, lovable and exasperating, and I cared about her intensely. Hilton keeps the pages turning with crisp prose and convincing dialogue, delivering an authentic and entertaining story brimming with wit and compassion. I loved The Hole in the Middle. It is honest, it is deeply moving — and it is really, really funny. In this, her debut novel, Kate Hilton captures the delicate and often unforgiving balancing act that is everyday life for so many women, and she does so with a graceful and nuanced eye for the absurdities of modern life. Hilton’s characters are authentic, unique and unforgettable, and The Hole in the Middle is an engaging novel that is both unexpectedly funny and remarkably wise. I loved this novel because I saw myself, my friends, and every woman who struggles with the modern paradox of having it all versus keeping it together—but I also loved it because of Hilton’s perfectly rendered revelations about life and love, and the beautiful honesty of her writing. A warm, memorable, and insightful heroine.